I was walking around my neighborhood and stopped at this store that I have always wanted to check and see what they offer. Inside I was greeted by a gentleman: a welcome with a big smile. Dresses and skirts displayed on the wooden walls. The usual girlish air around the textiles and clothes, of course a blue silk dress I am gazing at, “what’s the price?”, while the camera happened to be in my hands, as it does so often, which quite naturally brought the next question: “would you mind if I take a couple pictures of you…. and…. ask a few questions”? He says yes! “Few questions” about to last three hours listening to the story of this stranger. His name was Jampa, which means love in Tibetan language. I didn’t have to ask him many questions because immediately he felt like he had to open up and share with me an amazing life story that very well could become a movie. He said he came from a village in Tibet. His family had suffered under the Chinese local government. They had been tortured and imprisoned for a very long time and he was raised by his grandma. His grandparent and his two brothers were killed since they were against the Chinese invasion. Due to this, the family and he himself underwent a calvary of suffering. As he was growing up, he was deprived of a normal childhood and even of the very basic needs. His meals would mainly be grass or some fruits from the trees. His German shepherd dog was killed in front of his eyes. He was just a kid, but he still remembered how resentful he felt toward the Chinese soldiers. He was so mad that he stole some guns from them and fired as a sign of protest. When he was a teenager he was imprisoned for about six months. The day he was released he wrote a letter telling the Chinese that “Chinese belongs to China, and Tibet belongs to Tibet”. He made some pamphlets and glued them around the neighborhood and the village where he lived. Soon after that, he was arrested by the police who gave him the verdict that next day he was going to be killed. The family pleaded and wrote letters to the local government to please release their son for only two hours so that they could see him and then they would send him back. The moment he went home, his father had arranged for him a truck to take the son away. The father blessed the son and gave him a white scarf as a symbol of fortune. Also, his father tells him to live his life away from his country where his life was in danger. Hidden in the merchandise boxes in the truck, he passed through the village, while the police halted the truck every 15 minutes to control it. The truck driver drove Jampa to the next village, where another truck awaited him. His destination was the border, but that didn’t come easily since the police was after him. After many different trucks rides, finally he was able to reach the border city, but the ordeal didn’t end there. He had to walk for more than three months through the mountains at night trying to hide from people and anyone that was behind his back. He crossed the border walking along the Himalayas, seeing dead people bodies covered in snow. He waved at the dead people thinking that they were alive, because they had food in their mouth and their eyes were open. He got scared when he realized that they were dead, but he kept on walking, without any security that he would make it, and with no food in his stomach. When he reached Nepal, he saw some shepherds and asked for food and help, but instead they handed him to the Nepali police. In return, the police showed their generosity by beating him, taking all of his money and imprisoning him. He was able to escape from the police and ran away in fear and anguish that he would be caught. Thankfully, he was able to get to the main road where he hitchhiked the buses to give him a ride until the next place. Jampa’s troubles seemed to never end as his journey of freedom seemed to be not as free as he had imagined. The bus drivers threw him out of the bus because he didn’t have the money to pay for the ticket. This went on for quite some time until he reached India. In India, there was an agency that tried to help the refugees coming from Tibet. During this time he met Dali Lama, who lives in India and tries to help the refugees. He and other refugees were given the option to go to school and get an education, but Jampa refused because he wanted to work. 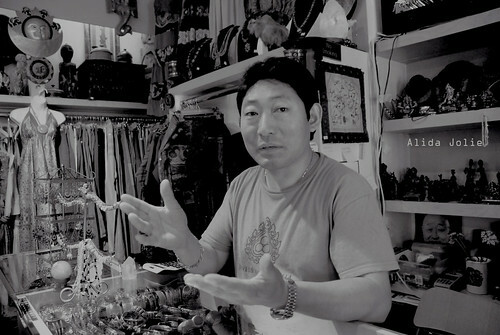 He was taken back to Nepal where he worked with people that make carpets and learned the business with Nepali people. He learned some of the language, made new friends and tried to make it into this new culture, but that wasn’t what his heart was after. Until one day he decided to go to the UN office and apply for an American visa. In his interview with the counselor he told him the real story of what has happened to him. While he was telling the truth, the other people that were waiting mocked and made fun of him, because he did not make up stories to fool the UN counselor. He walked away to have a cup of coffee and he thought to himself what a stupid man he was for being so honest and not telling some lies like the other people therein. The officer calls Jampa and says to him, why are you so sad? He tried to cover up his gloominess and said that he was doing fine forcing a smile on his face. The UN officer congratulated Jampa and told him that he was the only person that has been so truthful and open about his story. Jampa was granted the visa to come to the United States for about 6 months. Jampa landed in JFK in 1999. He didn’t know anyone here nor had he any relatives. He had heard in Nepal, only the name of Queens. So, when the Bangladeshi cab driver asked him “where to”, he replied “to Queens”. The driver asked him ”where in Queens? Queens it’s pretty large” and Jampa responded “just anywhere in Queens”. So, he was droped in Sunnyside, Queens. He had only one suitcase with him, and there he was, sitting and looking around this town where he didn’t know anyone. And there walked along this blonde girl that he coud tell she was from Tibet. He waved at her and she stopped to talk with him. The girl found out that he didn’t have anybody and offered him a place to spend the night. Next day he was able to take the train and stopped in China Town trying to find a Chinese employment agency. He spoke to the clerk, a woman, in Tibetan, Nepali, Indian and some Chinese as he did not speak any English. The woman sent him all the way to New Jersey. The new job that he was going to do was a dishwasher. Jampa had never done it before in his life. He said, his hands turned out white like chicken legs and his feet hurted so much from standing on his feet long hours. He wasn’t very fast at his job, but his boss liked him. He stayed for two weeks in New Jersey and then decided to move away because there were a lot of Chinese workers there giving him a hard time just because he was from Tibet. He decided to go back to Queens, but he got lost and went astray many times on his way back “home”. One time he ended up in Coney Island, the next ride he ended up in Bronx, until he finally was able to recognize the Citibank Building, which is a trademark of Queens. Jumping out of joy he returned to the apartment of the blonde girl, who got very worried, because she thought something bad might have happened to him. His life changed for better by living in the States. He was able to get his political asylum and establish himself with decent jobs. Everywhere he worked he was appraised and awarded for his hard work and strong work ethics. 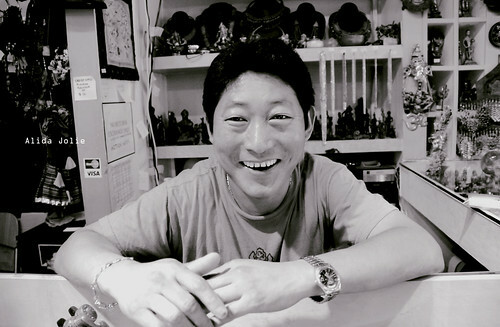 Currently, he is assisting the Tibetan community by teaching their kids to learn about their language and culture. Ever since he left Tibet, he hasn’t been able to return there. He told me that he keeps in touch with his family by emails or telephone. His brother buys multiple cell phone chips and after talking to Jampa, he throws them away in order to hide any traces of communicating with him. With a smile on his face he finished his story and thanked me for listening to him. He shook my hand as I was saying goodbye to him, and he said “now, you’re like part of my family”. I was touched by his words and I thanked him many times for sharing this tremendous life story with me.